This versatile bracket allows up to 45 degrees of pitch and 40 degrees of bidirectional yaw adjustment when mounting a Bose® Panaray® 802® Series IV speaker. 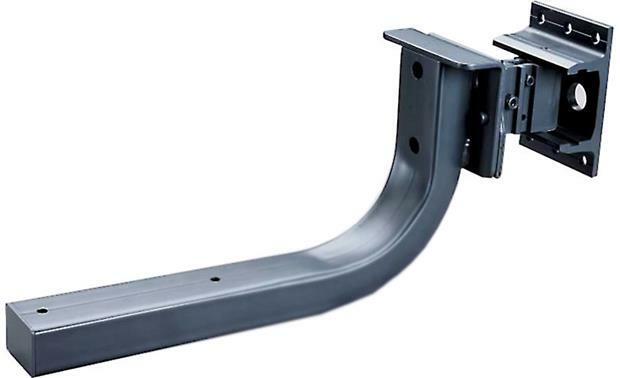 Overview: The WBP-8 bi-pivoting bracket was designed to wall-mount a Bose Panaray 802 Series IV loudspeaker, providing 0 or 45˚ of tilt (up or down) and a total of 80˚ of swivel (40˚ left/right). Made of heavy-duty steel, the mounting arm and swivel together give 21-1/4" of extension from the mounting surface when straight. Two bolt-holes in the mounting arm allow the speaker to sit on the arm and get bolted in from the bottom of the Panaray 802 speaker enclosure, while four M8 x 16mm bolts secure the mounting arm to the swiveling wall-mount. Two pre-installed bolts on the swiveling wall-mount are used to lock each direction of travel, one for the swivel and one that locks the tilt at either 0, 45˚ up, or 45˚ down. Total maximum extension from wall: 21.250"
Searches related to the Bose® WBP-8 Pivoting wall bracket for Bose® Panaray® 802 speaker.